Is your computer running (very) slow? Looking for a way to fix your slow computer (desktop PC or laptop)? Then you've come to the right place because this tutorial will show you how to make your Windows PC faster. Many people leave their computer running the whole day, or put their PC into sleep or hibernation mode rather than shutting it down completely. A full (cold) reboot (turning it completely off and on) can help sometimes. If you have programs installed on your PC, that you don't use, then it's better to uninstall them to free up disk space. Open the start menu, enter programs into the search bar and click on Programs and Features. Open Control Panel and click on Uninstall a program located under Programs. Open Control Panel and click Programs and Features. 2. Select the program you want to uninstall and click on Uninstall (located at the top of the programs list). Or right-click on the program and choose Uninstall. 3. When a Confirmation window appears, you click on Uninstall or Yes. Maybe you've made some changes recently, like installed a new program, new hardware (hard drive, CD/DVD drive, webcam, etc.) or updated a driver. If this is the case, then try to undo what you did and see if that helps. Before installing a new program or a new Windows version, you must always check the system requirements that are printed on the box or located on the product's product page. To get the best experience your system must at least comply with the recommended requirements. New software often requires new hardware or the other way around. After a while, there may be a lot of unnecessary files stored on your computer, so it's best to delete these files with the built-in Windows tool called Disk Cleanup. 1. Open the Windows Disk Cleanup tool. Go to the Windows search bar and search for cleanup and then click on Disk Cleanup when it appears. Press the [Windows] + [R] key on your keyboard, enter cleanmgr.exe, and then click on OK.
Open Windows Explorer or File Explorer (Windows 10), right-click on the (C:) drive, choose Properties and then click on Disk Cleanup located in the General tab. 2. If you have more than one drive or partition, then select the drive (partition) where Windows is installed (if not already selected) and click on OK. The (C:) drive is the default installation location for Windows. Disk Cleanup will now calculate how much space you will be able to free on your system drive. 3. If you are using Windows 8, 8.1 or 10, then click on Clean up system files to get a full cleanup. Windows Defender: Non-critical files used by Windows Defender. Setup Log Files: logs that just record what happens during an installation, and are used to diagnose problems when an install fails or is incomplete. Downloaded Program Files: ActiveX and Java applets downloaded automatically from the internet when you view certain pages. They are temporarily stored in the Download Programs Files folder on your hard disk. Temporary Internet Files: web pages stored on your hard drive for quick viewing. Device driver packages: Windows keeps copies of previously installed device driver packages from Windows update and other sources, even after installing newer versions of drivers. This option will delete older versions of drivers that are no longer needed. The most current version of each driver package will be kept. Delivery Optimization Files: files that were previously downloaded to your computer and can be deleted if currently unused by the Delivery Optimization service. Temporary Files: programs sometimes store temporary information in the TEMP folder. Before a program closes, it usually deletes this information. Windows Error Reporting: files used for error reporting and solution checking. Previous Windows installation(s): If you upgraded your PC from a previous version of Windows, Previous Windows Installation(s) will contain files from that installation. Thumbnails: Windows keeps a copy of all of your picture, video and document thumbnails so they can be displayed quickly when you open a folder. If you delete these thumbnails, they will be automatically recreated as needed. 6. Click on Delete Files. This may take a while. The time it takes depends on how many files need to be deleted. When it's finished, the tool will close by itself. Fragmentation happens to a volume over time as you save, change, or delete files. The changes that you save to a file are often stored in a different place on the volume than the original file. This doesn't change where the file appears in Windows—only where the bits of information that make up the file are stored on the actual volume. Over time, both the file and the volume itself become fragmented, and your computer slows down as it has to look in different places to open a single file. Windows has a built-in tool called Disk Defragmenter and this tool rearranges data on your drive and reunites fragmented data so that your computer can run more efficiently. Click on the start menu button, enter disk defragmenter into the search bar and then click on Disk Defragmenter when it appears. Open Control Panel, System and Security and then click on Defragment your hard drive located underneath Administrative Tools. Open Control Panel, open Administrative Tools and then click on Defragment and Optimize Drives. 2. Select the Windows drive. 3. Click on Defragment disk or Optimize. 4. When the defragmenting is finished, you can close the tool by clicking on Close. 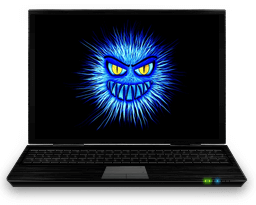 Malware (viruses, spyware, adware, rootkits, trojan horse, worms, etc.) can make a computer slow (sometimes even extremely slow). First, you should update your antivirus software and then perform a full system scan with your antivirus and after that, you should scan your PC with multiple malware scanners and removal tools. Too many processes running in the background can slow down the performance of your computer. Sometimes there are processes running in the background that are not needed, so it's better to stop them. Windows has a built-in tool called Process Explorer that can be used to list all programs running on your Windows system. Process Explorer is more comprehensive than the Windows Task Manager. Warning! If you don't know what a process does, search its name. Do not disable processes if you are unsure because some processes are necessary for some software (e.g., antivirus) to function normally. Click on the start menu button, click on Run, enter msconfig and then click on OK.
On Windows 8, 8.1 and 10, you right-click on the start menu, click on Run, enter msconfig and then click on OK.
3. 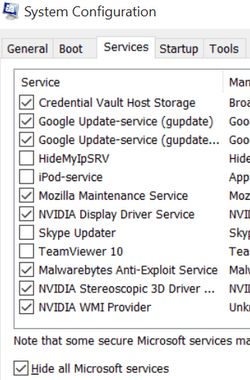 Check the Hide all Microsoft services option at the bottom. 4. Uncheck the service(s) that don't need to run in the background. 1. Open the Windows Command Prompt as administrator. In Windows 8.1 and 10, you right-click on the start menu button and choose Command Prompt (Admin). In Windows Vista and 7, you click on the start menu button, click on All Programs, click on Accessories, right-click on Command prompt and choose Run as administrator. In Windows Vista and 7, you click on the start menu button, enter cmd into the search bar and then press the [CTRL] + [SHIFT] + [ENTER] keys on your keyboard. The sfc /scannow command will now scan all protected system files and will try to replace corrupted files with a cached copy. Note: Do not close the Command Prompt window until the verification is 100% completed. The scan results will be shown after this process is finished. On laptops and netbooks, the processor speed is altered in accordance with energy settings (and if you are running on battery power). 2. Select High Performance and close the window. It's very important to keep Windows and programs always up-to-date because some updates (especially security updates) can prevent Malware (computer viruses, spyware, adware, rootkits, trojan horse, worms, etc..) from infecting and slowing down your PC. When a computer gets too hot, the CPU fan will speed up and this can lead to slow processing speed. Don't clean the registry, because it can fragment your registry. The registry doesn't need to be cleaned. Some web browser extensions can also make your PC slow. Disable or remove browser extensions and toolbars you don't need.